This homemade deodorant is specially designed for women. It contains herbs that are used to promote lymph flow and prevent or treat issues with inflamed or cystic breast tissue. Instead of applying a chemical laden, potentially toxic-to-your-breasts product under your arms each day, try this healthy herbal alternative instead! To make this deodorant, you’ll first need to infuse coconut oil with herbs. Coconut oil is most often used because of its antibacterial and antifungal properties. If you’re allergic to coconut oil, you could test out using babassu oil instead, as it’s sometimes used as a substitute for coconut oil. Susun Weed already has great write-ups about these herbs, plus several others I didn’t list, so definitely hop over HERE, HERE and HERE to read her articles for a deeper understanding of how they work. – Make sure that your herbs are dried before infusing. Water content from fresh herbs can sometimes make your oil spoil faster. Your herbs should be freshly dried though and not old or discolored or they won’t offer the benefits we’re looking for. – Set the jar down into a small saucepan containing a couple of inches of water, forming a makeshift double boiler. Place the pan over a medium-low burner for about two hours. The heat will help infuse the properties of the herbs into the oil. After infusing you can strain the herbs and use right away. Alternatively, and what I most often do, is to let the jar of oil and herbs sit in a warm sunny window for at least another week or two, to make sure the oil is even more deeply infused. Neem Oil – a strong antimicrobial oil that fights odor causing bacteria, but it also has a strong scent. Use sparingly. If you really dislike the scent, you can omit it. Check with a doctor before using neem if pregnant, nursing or a young child. Arrowroot Powder & Kaolin Clay – to absorb excess moisture and odors. Hemp Oil – I like this oil because of its skin nourishing properties and because it absorbs into the skin well, but you can use your own favorite light (liquid) oil, such as sunflower, sweet almond, avocado and so forth, if you’d like. Shea Butter – protects and conditions skin. Unrefined shea has more benefits, but some people (including me) dislike the raw scent, so I like using refined shea butter instead. You could also use other types of butter such as mango or cocoa. 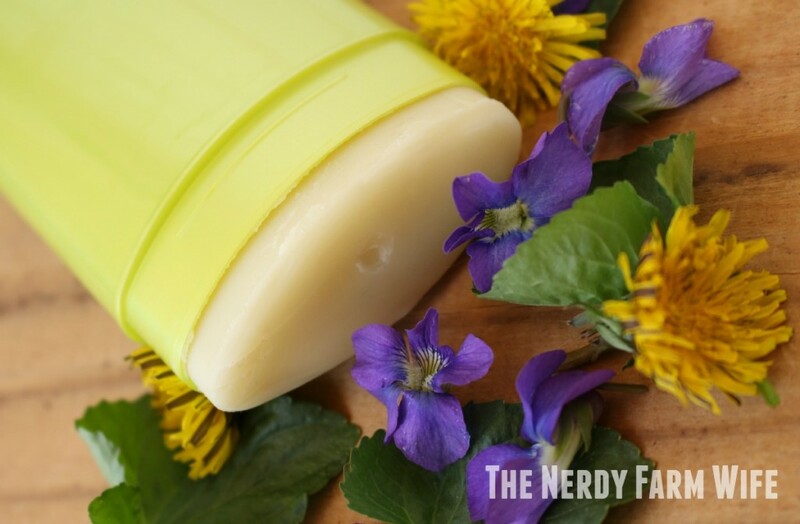 Beeswax – makes this deodorant thick enough to apply using a tube style container. You can leave it out and tinker with the ratios of arrowroot and clay to make it a thick paste to apply with your fingers. Or, you can use a smidge less beeswax and apply it like a salve, if you’d like to avoid a plastic container altogether. (See the next note.) Vegans can use roughly half as much candelilla wax instead. Essential Oils – mostly for scent, but tea tree is antimicrobial and lavender is skin soothing. You can use other scents, if you prefer. This recipe does not contain baking soda, since many people find it irritates their skin. You can add some in though, if you’d like, swapping out some of the kaolin clay or arrowroot powder. The consistency, scent and texture of your basic ingredients will vary depending upon where you bought them, how they’ve been stored, what season it is and so forth. Everything in this recipe is adjustable and flexible. Don’t be afraid to remelt and change up things if you find it too soft, too hard or not exactly as you’d like it to be! Normally, I try to avoid storing homemade body products in plastic, however, some old deodorant tubes are what I had on hand to use and for some reason, that didn’t cross my mind as it normally would. Not long after making and using though, the disconnect between combining a plastic container with a product I was hoping would help with my higher risk of breast cancer (my mom & grandma had it pre-menopause) finally dawned on me, so I scooped it out and now keep it in a glass container. This batch filled two empty 2.6 ounce deodorant containers similar to these at Amazon, with a tiny bit leftover. 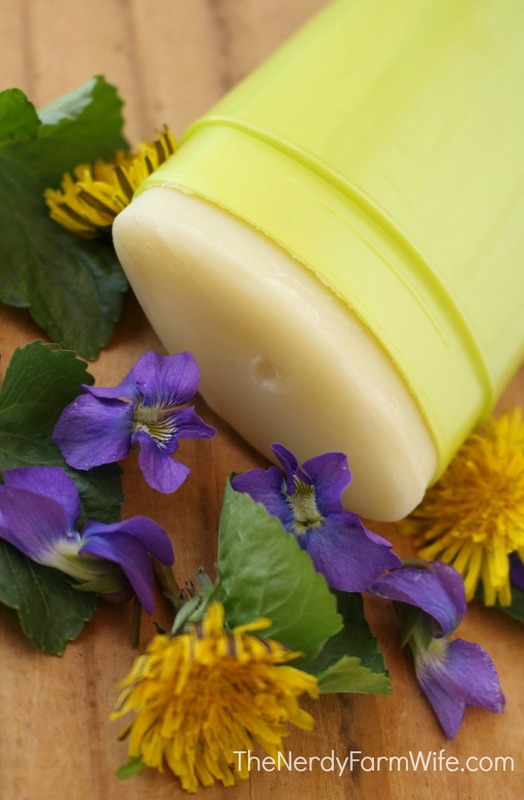 Using a heat proof glass jar or container, combine the coconut, neem and hemp oils with the beeswax and shea. Set the container or jar into a saucepan containing a few inches of water. Stir in the clay, arrowroot and essential oils. The mixture will thicken, but let it cool a bit, stirring frequently, before spooning into tubes (or glass jars if applying with your fingers.) If you don’t, the clay and arrowroot may settle to the bottom as it cools instead of being incorporated throughout. Let the deodorant set up until firm. Rub a thin, single layer under each arm. You do not want to push hard or slather this on, a little bit will go a long way! Wait a few minutes before dressing after use, to allow it to absorb into the skin a bit. I haven’t had any staining from this deodorant, but I live in t-shirts so am not sure how it will do with fancier clothing. 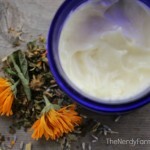 Did you enjoy this DIY herbal deodorant tutorial? If so, let’s keep in touch! 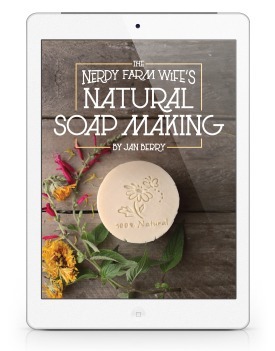 Be sure to sign up for my newsletter (HERE) and get my latest soap ideas, herbal projects and DIY body care recipes sent straight to your inbox, once a month(ish). No spam ever and you can unsubscribe at any time. Tagged dandelions, deodorant, violets. Bookmark the permalink. Good morning Kathy! I’m happy that you like the recipe and thanks for sharing too! Sweet. We get all of those herbs growing around here, presuming you mean the ‘weed’ plantain and not the banana-like fruit? Hi Kristina! Yes – the leafy weed plantain that grows all over our yards is exactly what you want. 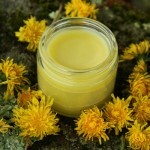 Your blog is a goldmine of herbal craft, and this recipe sounds so wonderful. I’ll be trying it as soon as my itsy calendula plants can be harvested. Thank you for sharing. Thanks for the kind words Toni and I hope you like the recipe! It brings me joy to read that other women are thinking of such things. Smearing chemicals on my skin freaks me out! I’ve been trying to find a formula I like, and it’s hit and miss so far, so I’m happy to see you have one to try. One thing I did that helped homemade work better was to do an armpit-detox. I went 3 weeks without using any deodorants while twice a day spraying off with a mix of ACV and lavender e.o. That made a huge difference in the efficacy of my homemade stuff. This might be too much info, but I lost my mom to breast cancer, her mom (my grandma) to ovarian cancer, and my sister was diagnosed at 38 with ovarian. My sister survived, she found it early. I will do everything in my power to make sure I don’t add to my already heavy gene pool. I love life! As always, thanks for sharing your gifts and all your lovely formulas. Hi Melanie, That’s a great idea about the armpit detox – thanks for sharing that! I’m so sorry about the loss of your loved ones to cancer. I know how you feel about the genetic disadvantage – I try to do everything I can to beat those odds too! Will you share your recipe for the armpit detox please? Hello! Thank you for all your inspiring ideas! After reading your posts, I feel like ‘I can do it’ and empowered. I like peppermint and rosemary essential oils and am wondering if they could work too in this recipe, Have you ever tried those? Also, I have sea and bentonite clays on hand. Could I swap those for kaolin? I never though about making my own deodorant. Thanks for the recipe. I hope its not too hard to make. I simply wanted to tell you how impressed I am with your generosity. I really have never received a newsletter where the sender has been as selfless and intentionally trying to make the world a better place… starting of course with the individual. That may sound a bit ‘canned’ but, trust me, I know from what I speak. Thank you and blessings. May every note and recipe and suggestion and response you send out come back to you eighteen fold. Hi Ellin, Thank you so much for taking the time to write such kind and encouraging words! I appreciate you doing so – you just made my whole evening a brighter and happier one. Thank you! Just a curiosity question: Wouldn’t omitting the beeswax make it more spreadable to use from a glass jar? Hi Connie! Yes, you’re exactly right. If you leave out beeswax, it should be more spreadable. As it is, it’s like a firm salve or almost like rubbing chapstick on, but under your arms. Sort of. :) You can lower the beeswax to get a softer salve like consistency or leave it out completely (though you may need to increase the arrowroot and clay then, so it won’t be too soft.) It’s kind of one of those recipes you can tinker with and change it around to suit your preferences! Thankyou SO much for this! Can’t wait to experiment! Having so much fun getting back to herbs and making soap after a gap of many many years! Thank goodness for the internet and all the resources out there now – and yours have been particularly helpful, so thanks again! At the moment, I am using zinc oxide with some clay, with organic coconut oil, mixed with kettle water, with colloidal silver, with non GM soya lecitihin to emulsify the cream and with Palmarosa essential oil. It is OK and makes the underarms a bit grey. The main thing is that it WORKS, even on a lady with night sweats. Zinc is something that one needs in one’s body. Zinc oxide has long been used in zinc and castor oil diaper cream. I thought it may work like the aluminium in roll on and it does seem to work. I think all of these ingredients in this are totally non toxic, OK to put in one’s mouth even and I wondered if anyone else would like to play about with these ingredients I have mixed up. I am still experimenting and would really like other people to experiment with some of my ingredients. Hi Ursula, That sounds like a fantastic combination! I haven’t tried working with zinc oxide before, but I’ve heard it’s really great in deodorant recipes. 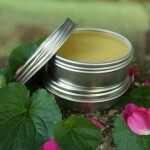 I love the idea of colloidal silver and making a cream deodorant as well. You have lots of great ideas! Thanks for sharing the ingredients you’re working with – I know that will help others who come along too and I hope they’ll leave feedback as they do! Drying dandelion flowers tends to turn them into fluff–at least every time I’ve tried it! I just let them wilt on a cookie sheet (on paper towels or something else absorbent) for a couple of days when using them in something like this. Do you have a different way to dry them? Hi Kathy2! They sometimes turn to fluff for me too. I’ve never quite pinpointed why some day’s flower pickings are more prone to do so than others. The longer they dry, the more likely they are to do that, so as soon as you think they’re dry enough, you can go ahead and pop them in the oil. Even if most of the flowers end up on the fluffy side, they’re still great to use in recipes like this. You need to pick the dandelions when there is a tight bulls-eye type center; try to pick them as early as possible in the morning. Thanks for the tip Natalie! Has any research been done about use of Neem Oil on pre-menopausal women who may be wanting to get pregnant? I was using it on my chickens legs for mites, because it changes the hormones of the insect so that they can’t breed – and my chickens stopped laying eggs and didn’t start again and my rooster became infertile. Now, he was an old rooster, so maybe that was coincidence and in a free range flock, I was never 100% sure who was laying eggs, but it seemed like those original chickens never came back to laying. I have been careful with it since, not to use it on breeding animals – although as I say, this is a question / suspicion only. Hi Jenny, That is fascinating information! I haven’t seen any research on that, but I’ll definitely keep my eyes peeled. I have to do some upcoming in-depth research on oils for another project I’m working on and will keep that in mind to look up. Thanks for sharing your observations with us! Hi Jenny, I only have a few more minutes before I have to hop off the computer for much of the day, but I was so curious, I did do a brief search into what you said about neem and fertility. I found this site, with a big caveat: I don’t usually put a lot of stock in what a site that is plastered in AdSense ads says, but they do have a list of studies that I want to look into further. http://www.discoverneem.com/neem-oil-birth-control.html#neem-oil-birth-control I’ll sit down and do that one day, but thought you might like to look at it sooner. Thanks again for bringing up this topic as it’s definitely something I’d like to research more! p.s. Love your newsletters – very informative! This looks like an exciting deodorant blend to try! What is the purpose of the Neem oil please? Thanks much. Hi Mary! I wear casual t-shirts all the time and it does fine for that. However, I’m just not sure when it comes to other materials, especially dry clean only blouses. You want to apply a very thin layer and give it a few minutes to soak in before dressing, but if you’re wearing something expensive, then you might want to forgo using it, just in case. Jan, just to say this deodorant recipe is so very good. It must be the fourth or fifth recipe I’ve tried – the others haven’t exactly been failures, but they’ve all tended to be a bit too dry so they drag the skin when applied. So my expectations were a bit low… but this is fantastic. It’s just a little teeny bit oily so it glides on. Have made some for my daughter and sons’ girlfriends. Everyone agrees how good it is, not only effective as a deodorant but it smells nice too. I had to fiddle about a bit to get it into a twist up tube – letting it semi harden so I could make a bottom layer, then heating the remainder up again to pour over this layer. Like all your recipes that I’ve tried to date, it’s a winner. Thank you. Can I put a lid on the jar, when infusing the oil, so h2o doesn’t get in? Why do you use more oil than plant? My son has seeping eczema, and we have a ton of violet growing wild in our yard. So I would think the more plant the better. Thanks! Hi Regina! I keep the lid off of jars when they’re being heated, because I’m afraid of forming a vacuum that might make the jar break. I’m not sure if that would even happen outside of theory, but I’d rather play it safe. You could probably set the lid on lightly though. No water should get in, since the heat is low and it won’t be boiling or steaming. I use more oil than plant so that the plant matter is completely covered. Any uncovered spots aren’t being infused. 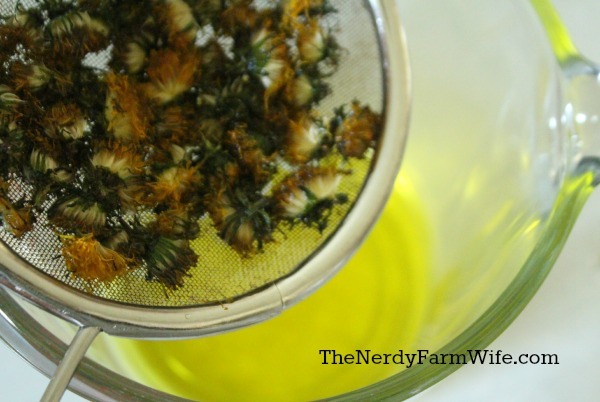 Also, if you infuse your oils the slow way, any plant that’s not covered in oil will be prone to mold. You can definitely experiment with adding more and more plant material until you reach just the right amount for you though – these are just the guidelines I use. Feel free to adapt the recipe to suit your needs. I hope you’re able to find something to help your son’s eczema – I know it’s a miserable condition! I have been trying recipes for deodorant for two years. For some reason, I have been reacting to all of them. Will try this. I, too, am concerned with the plastic especially in the arm pit area where any toxins may be absorbed and circulated. This recipe seems as though it will harden enough to be molded like hard lotion bars and used in the same fashion of a deodorant tube–minus the plastic. Hi Gale! Two big culprits that cause reactions in deodorant recipes are the baking soda or coconut oil. You can leave out baking soda or replace it with arrowroot or a type of clay (I like kaolin). Coconut oil allergy is pretty sneaky and shows itself more as dry, chapped, red skin. Babassu oil is very similar in texture and often makes a great substitute, or you could try a more liquid oil and just increase the beeswax. I did try to make these first as “deodorant sticks” – like a lotion bar, but they were a little too soft. I think though that you could experiment with adding more beeswax and give it a go! I hope you’re able to find the perfect recipe for you! I really like the idea of herbal infused coconut oil and the fact that it helps prevent breast cancer it awesome, my mom, and both of my grandmas had it. I was wondering if there was any other recipes that this would work in, lotions or soaps or something? Hi Sydney, Yes! You could definitely use the infused oil in a lotion recipe. Or, infuse the herbs in a more liquid oil (like sunflower or olive or sweet almond) and just plug that into any standard lotion or cream recipe that you find, that you like the looks of. I’m sure you could use it in soap too – I’m not sure how exactly how many of the benefits would make it through the process, but that’s a really fantastic idea! Hi Vanessa, Thanks for the kind words! :) I’m happy you like the deodorant recipe too! Hi Vanessa! What color was your clay? Mine is very white. Perhaps you have a different grade of kaolin clay? I know it comes in rose too (which is so pretty in soap! ), so I bet it comes in other colors as well. It should act in the same way though. I agree with your daughter that neem oil has quite a strong smell! :) I add enough essential oils so the scent is barely there and that helps a lot. Have you seen the deodorant recipes at Scratch Mommy? 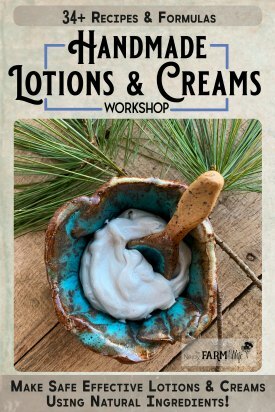 I’ve heard fantastic feedback from her’s as well – http://www.scratchmommy.com/effective-easy-homemade-deodorant/ She has one or two more somewhere on her site too, I believe. You can put in a variety of essential oils for scent, maybe peppermint or lemongrass or lime, that she might find more pleasing. Leaving out the neem would help too. :) I hope you have a lovely day too! Hi Jan, thanks for responding. Yes you are right my clay is pink French clay… Oh well !! Thanks for the website from scratch mommy and G’Day from Darwin ? Hey Jan. Love your homemade deo recipes! One quick question though, can you leave out the shea, mango, cocoa (etc) butter? Thanks and can’t wait to get your book! Hi Melanie! I’ve never tried it without, but I think you could probably drop the butter and just increase the beeswax to help make up for some of the firmness the shea contributed. What would be a good alternative to neem oil? Hi Melany! The neem oil is added for its antimicrobial properties, but it does have a strong odor that some people don’t care to work with. If you need to leave it out, you can just add more liquid oil (like sunflower, sweet almond, olive, etc) to replace it, which will help keep the deodorant’s texture the same. You’ll just end up with a milder acting deodorant. I don’t put neem oil in all of my homemade deodorants, so it’s not a must – just a nice add-in if you want a little stronger option. I have to wear a uniform and unfortunately it is grey and gets pit stains very easily. Does this deodorant help prevent sweating? Thanks for the recipe regardless! Hi AJ! This deodorant doesn’t really help prevent sweating, just odor. You’ll want an antiperspirant for that. Hi Debbie! It could very well be the clay. Mine is pure white, but if your clay is gray-toned it could cause that color. The yellow comes from the infused oils, so it will depend on which herbs you use and how strongly infused the oils are as to whether it stays yellow or not. Thank you so much for this amazing recipe! I’ve been trying out different homemade deos to avoid the lethal aluminum found in store bought brands, so I love that you combat the aluminum issue by adding in herbs that will have positive effects in that area! How exactly do you recommend to strain the coconut oil of the herbs? Hi Nataly! I strain coconut oil by heating it up to a liquid and then pouring the oil through a stainless steel fine mesh sieve. It usually catches most everything, and any teeny bits that make it through will settle to the bottom and can be worked around. I am wondering if it would be OK to store this in a jar instead of a tube? I love your blog, you’re so creative! I just bought your book and want to make your Lemongrass Cream deodorant but I wanted to be able to put it in a tube. Do you know how I could adjust that recipe to make it so it can go into a tube. I know you have other recipes that can go in a tube, but in the book you say that it is your favorite one so far. P.S. Your book is brilliant!!! Hi Brooke, I’m so happy that you like the book! 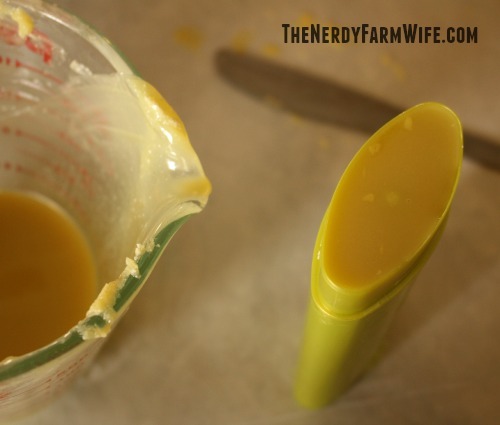 I haven’t tried making the lemongrass cream deodorant in tube form, though that’s a great idea! I think with some adjustments to the liquid oil and shea butter portions, it should work well in a tube. Both that recipe and this one have the same amount of coconut oil, arrowroot, and baking soda (for that one)/kaolin clay (for this one), so those shouldn’t need to be adjusted. Beeswax amount is the same in both, but you might need to adjust it up a bit in summer, depending on your climate. 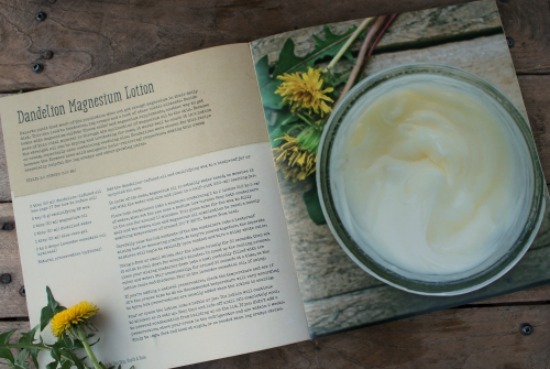 In the lemongrass cream recipe, there’s 1.5 oz sunflower oil and 1 oz shea butter. This gives a nice creamy spreadable texture. In this one, there’s around 1 oz liquid oils and 1.8 oz shea butter. That helps it be in more of a solid form so it can pour into a tube, but still be soft enough to spread on. So, I think if you dropped the amount of sunflower (or other) oil to 1 oz and increased shea butter to 1.8 oz and perhaps added a tiny extra pinch of beeswax if your summers are very hot – it should work! Thank you so much Jan! I will absolutely try it and let you know how it works. And I must say…I am so happy that I purchased your book. I just found out that I am pregnant and really want to make sure that I am only using healthy natural things on myself and in my home (and on a little one soon). Your book is full of wonderful recipes that can help me do that. I have made your lotion bars already and they are spectacular. So thank you, your hard work and dedication has impacted our lives. This is super exciting to make your own deodorant! But am wondering what herbal infused coconut oil is? I do have organic coconut oil – do I need to do something special with my coconut oil? Hi Jan, this is an awesome recipe. Might sound silly but have to ask whether you sell or could sell some dried dandelion flowers? :-) I have the rest of the ingredients but dandelion flowers and I could not even find them online. Dried roots, leaves but not flowers. Hi Regina! So happy that you like the recipe! I don’t sell dried dandelion flowers, but I have seen some on Etsy every so often. Hi Jan! Loving this recipe! I have 2 questions: #1 If I want to add baking soda, how much? #2 My deodorant came out green. I infused violet leaf in my coconut oil. Do you think that is what made it green? Thanks! Hello and thank you for this recipe and all you do! I made this for myself and several women in the locker room smelled it and wanted some so I’ve sold three jars so far. And I wasn’t planning on selling this! I’m infusing coconut oil for a second batch now. PS: I like be your book and your soap e-book, too. Thank you. Hello, and thanks for this deodorant recipe! 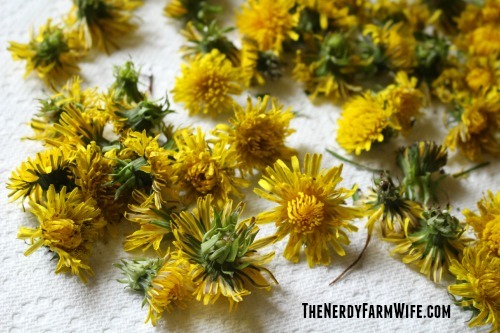 Do you have any tips for drying dandelions? Mine immediately turn to fluff every time! Thank you! PS I have your book and love it!